(Phys.org) -- A team of scientists from Japan and England have hit the high mark in exploring and testing unconventional forms of computation. They have built and tested a computer using crabs. This is a computer in which the information carriers are swarming creatures, namely, soldier crabs. In their paper, Robust Soldier Crab Ball Gate, authors Yukio-Pegio Gunji, Yuta Nishiyama, and Andrew Adamatzky describe what others are already referring to as the crab-puter. The scientists were interested to see if they could adapt a previous model of unconventional computing, based on colliding billiard balls, to work with swarms of crabs. 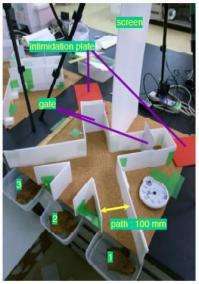 To expand the family of unconventional spatially extended computers, we studied the swarming behavior of soldier crabs Mictyris guinotae and found that compact propagating groups of crabs emerge and endure under noisy external stimulation. We speculated that swarms can behave similarly to billiard balls and thus implement basic circuits of collision-based computing, they stated. The researchers found that when two swarms of crabs collide, they merge and continue in a direction that is the sum of their velocities. Their reference to billiard balls is noteworthy, in that computer scientists E. Fredken and T. Toffoli in the 1980s -- explorations of unconventional forms of computing have been going on for some time -- set out to see if a computer built with billiard balls could work. In this recent computer feat, the team constructed logic gates that exploit the swarming behavior of soldier crabs. They said that "We demonstrate that swarms of soldier crabs can implement logical gates when placed in a geometrically constrained environment." The swarms of soldier crabs herded through tunnels can form the AND, OR and NOT logic gates. Working initially with simulated swarms, the authors found that the OR gate worked every time--this is the gate which combined one or two swarms into one. The AND gate was more complicated, according to the New Scientist, which involved the combined swarm heading down one of three paths. The AND gate turned out to be less reliable. Next, the team used using swarms of 40 crabs tested the logic gates for real. The swarms were placed at the entrances of the logic gates and encouraged to move by a shadow intended to convince the crabs that there was a predatory bird overhead. Results closely matched those of the simulation, suggesting that crab-powered computers were possible. In their study, the authors include a parting note to assure that the crabs submitted to testing were not harmed, and that the crabs were kept in comfortable condition. They also said that after all the experiments, the crabs were released to their natural habitats. Soldier crabs Mictyris guinotae exhibit pronounced swarming behaviour. The swarms of the crabs tolerant of perturbations. In computer models and laboratory experiments we demonstrate that swarms of soldier crabs can implement logical gates when placed in a geometrically constrained environment. "suggesting that crab-powered computers were possible"
In recent news, with the death of the silicon-based semiconductor industry, computers of drastically reduced computation power are now the size of buildings and require millions of soldier crabs. The computer requires a large staff to feed the crabs and clean the computer channels. In a completely unrealted stories, natural populations of soldier crabs, and seagulls, their primary predator, are plummeting, while beachside plankton and insect growths are rendering popular beaches dangerous. Soon we will have crab-powered spaceships, utilizing interstellar crabholes to travel out into the universe. Meanwhile, a supercrabputer goes wrong in Osaka Japan, resulting in mass shelling in several districts. lol.... to scale it down they will use some venereal crabs next. Giant enemy crab computer! Eat its delicious crabs for massive computational failure! When I was twelve or thirteen years old, I was thinking about making a computer that will operate with weights hanging from strings. Or, was it when I was fifteen-sixteen? "The researchers found that when two swarms of crabs collide, they merge and continue in a direction that is the sum of their velocities." I assume this means if one group is going North and the other is going East at equal speeds, the new group will go Northeast at the same speed both groups were going at? Not that if both groups were going approximately North, they would continue North, but at double speed and eventually be going hundreds of miles per hour? "when two groups collide, they unite into one larger group whose velocity matched that of the two separate groups combined." Which was much more confusing assuming my above interpretation is correct. Should we expect a quad-crab version any time now? In the case where ethe data or crabs collide is there an alternative to a bsod? Perhaps if this data is the right type its called lunch? The Rabbit and Hyena Computer (RAHC) has proved to be challenging in its new application as navigational system due to predatory decimation of its logic variables. It is now thought that a Sardine and Fish Eagle computer (SARFE) could be easier to maintain, then again some experts believe that fire-ants could lead to miniaturisation of such computational systems. I am just wondering what a call to the IT department would be like, in case of one or more "malfunctioning" crabs.